2016 marks the 100th time Pennsylvania has celebrated agriculture and farmers with a multi-day exhibition in the state capitol of Harrisburg. 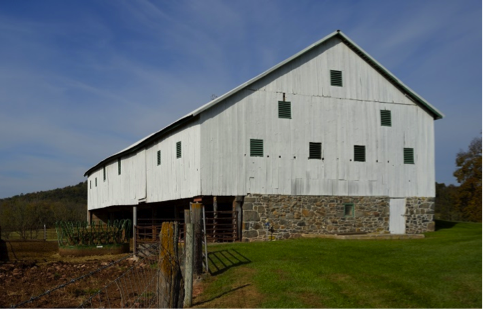 Building on the number 100, this year Pennsylvania’s Historic Preservation Office is partnering with the State’s Department of Agriculture’s Century Farm Program to recognize farms that have been owned and operated by members of the same family for at least 100 years. The Farm Show, as it now known, takes place in Harrisburg the second week in January and is one of Pennsylvania’s valued traditions. It has its roots in 19th century agricultural fairs that were common across the state. In 1916, the then Pennsylvania Secretary of Agriculture Charles Patton organized a new type of agricultural fair. In January 1917, the “Pennsylvania Corn, Fruit, Vegetable, Dairy Products, and Wool Show” was held in a farm machinery dealer’s building in Harrisburg. The Show was a success, and became an annual event, evolving into what is now the Farm Show. In 1921, the Show presented its first livestock exhibits, for beef and dairy cattle, horses, sheep, and swine. The first livestock competitions and sales were held in 1922. The next year poultry exhibits were included, and the event expanded from three days to five. In the late 1920s a dedicated complex for the Farm Show was built in the State Capitol city of Harrisburg. The Farm Show continued to expand, adding participants from 4-H clubs, the Future Farmers of America, Future Homemakers of America, the Grange, State Mounted Police, Penn State’s College of Agriculture, and students from vocational schools. The Farm Show includes many popular events ranging from a draft horse hitch competition to the “sheep to shawl contest,” and judging for the best of Pennsylvania’s agricultural products, such as Christmas trees, apples, and wines. And in 2016, it featured the state’s Century Farms program. Most states have established Century Farm programs to recognize the deep roots and significant role of family farming as part of a state’s agricultural heritage. The idea started in New York State in 1937 as an initiative of the New York State Agricultural Society. Northern Pennsylvania’s Bradford County was inspired by New York to create a Century Farm program for their county in 1949. 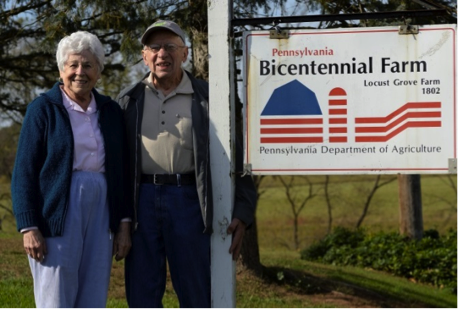 Pennsylvania’s Department of Agriculture expanded it into a statewide program in 1976—like many other states they were moved to recognize historic farms as part of the bicentennial celebration in 1976. How do farmers qualify for the program? To become a Century Farm in Pennsylvania farmers must demonstrate that they have owned the farm for at least 100 years, a family member must live on the farm and the farm must consist of at least 10 acres of the original holdings or gross more than $1,000 annually in farm products. Although the benefits are only honorific, with the Secretary of Agriculture awarding the family a special certificate, there is continued interest in participating. At this time there are over 2,000 Century farms located in every county of Pennsylvania except Philadelphia. In 2004 Pennsylvania even added a new category for Bicentennial Farms, for properties owned and operated by the same family for over 200 years. 167 properties have met the criteria for this distinction. At the 2016 Farm Show the State’s Historic Preservation Office joined the Department of Agriculture in commemorating the state’s farming heritage with an exhibit featuring some of the new Century Farms as well as farms that are also listed in the National Register of Historic Places. Farms can be eligible for the National Register as important examples of local farming trends, for the architectural merit of their buildings, or for developing new agricultural practices. At this time only 17 farms are identified as having been designated as both Century and National Register properties. Examples include the Horner family farm, Locust Grove in Adams Co., which has been in the family since 1802. Listed in the National Register in 2007, the farm has achieved Bicentennial Farm status. Current use of the farm includes raising beef cattle. A recently designated Century Farm is the Homan Family Farm, Centre Co., purchased by the family in 1913. The 293-acre farm was listed in the National Register in 1980 and designated a Century Farm in 2014. Actively farmed, the land is also protected by an easement. 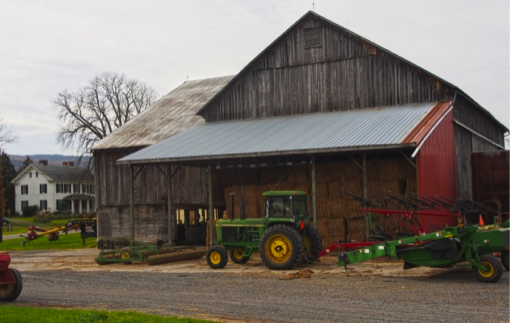 Pennsylvania’s family farms are an important part of the state’s landscape and economy, both past and future. Early in the 20th century there were over 225,000 family farms in Pennsylvania. Today there are fewer than 59,000. Designating new Century and National Register Farms builds awareness of their important role in our past, honors the families who have cared for them, and promotes their contributions to our future. In the words of the Century Farm certificate, the families that own these historic farms have “demonstrated a durability and love of the land” that deserves our appreciation and gratitude. Many thanks to April Frantz and the Pennsylvania State Historic Preservation Office for providing the original blog post (http://pahistoricpreservation.com) on which this article is based, and to Don Giles and Dave Maher of the Pennsylvania Historical & Museum Commission for the photographs.